Our ball valves are constructed with a full-flow body design, enabling the product to pass through the valve with no restrictions and with a minimal pressure drop. The basic design allows cleaning and product recovery using pigging systems, and they are ideal for use with viscous liquids and liquids containing solid or semi-solid particles. Alfa Laval ball valves for hygienic use bear the Alfa Laval SBV and Alfa Laval Tri-Clover® designations. 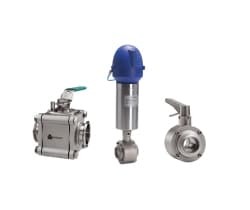 Alfa Laval 5308/5309 Series Ball Valves are designed for use as a product valve and are available with pneumatic actuators or manually-operated handles. Ideal for applications that involve high operating pressure and temperatures. Full-bore flow valves that provide on/off control with minimal pressure drop. The valve opening has a constant pipeline diameter, which enables fluids to flow freely through the valves when open. The SBV can be supplied with either automated or manual control.